As our small group meeting was ending, the leader asked if anyone would close us in prayer. Instinctively, I buried my head in my Bible, trying not to make eye contact, hoping desperately one of the “good pray-ers” would volunteer. You know, the ones who always sound so eloquent and seem to have the perfect words. I squirmed a little in my chair, feeling my face become flushed, as the leader looked for someone to ask. Have you ever felt this way? Why are we so afraid to pray in public? Why are we so uncertain even in our private prayer time? Why are we so intimidated by prayer? I used to think prayers had to be said a certain way or use special poetic language. The prayers I always heard at church were so beautifully written. I didn’t always understand them, but loved how they sounded. However, I could never get my prayers to sound quite the same. I got frustrated and felt that my prayers weren’t good enough or weren’t the right words to take to God. Then I learned that prayer is just a conversation with God and He wants to talk with us in whatever words we can muster, even when we can’t even find the words to say. We don’t have to follow a set script or formula. We don’t have to use any specific words or poetic phrases. We just have to be present and start a dialog. Let’s look at some key elements of a good conversation and see how we can apply these to prayer. I don’t always get all of these incorporated into each prayer. Sometimes my prayer will focus on just one or two, but I do try to touch on each throughout the day. Who doesn’t like to hear something nice? We all love when a friend says something nice – compliments our hair or shoes, praises something we’ve done. God’s no different. He loves to hear us praise Him. God, you are amazing! What an awesome sunrise you created this morning! We drill this into our children all the time to say ‘thank you’ anytime someone gives you something. It’s a common curtesy and makes the other person feel appreciated and more willing to give again. Thank you, God, for the blessings You pour down upon us. Thank you for bringing us together this day, to read and study Your word and to learn how to have better conversations with You. God wants to be part of your life. To truly let Him in, you need to share what’s happening in your life, what’s on your heart. Maybe a concern you have from the day. Maybe a decision you need to make. Maybe something that’s causing you stress and worry. What would you share if you were having this conversation with a friend? God, sometimes I struggle with prayer. I know I should feel more comfortable talking to You and I should volunteer more to lead our group in prayer, but I just don’t feel I’ll have the right words. I’m sorry for not trusting You to guide me and help me find the words. Sorry for not believing You want to hear whatever words I have. I know prayer is not a contest for who has the best words, but instead is an offering of ourselves to You. Asking for ourselves and others is an essential part of prayer. This is where prayer can be so powerful and effective. Pour out your heart to God, asking Him for help, guidance, and healing. Pray for yourself and pray for others. Lord, help me be more confident in my prayers so I can be a stronger leader. Help me boldly pray for myself and others, and then truly believe You are at work in these requests. When I can’t find the right words, I trust You know even the groanings of my heart. Finally, listen for God. Don’t fill all your prayer time with your own words. If you were talking to someone in person, you’d give them a chance to talk, right? So, allow God the same space. You may not always hear Him in that moment, but be sure you build those quiet listening times into your life so you can hear God. Lord, hear these prayers and go with us into this day. Equip us to better pray and have heart-felt conversations with You so we can continually grow closer in our relationship with You. Amen. I still may not be the first one to volunteer to lead the group in prayer, but I do feel more confident when I am asked or do volunteer. Learning that prayer is just a conversation and I can just let the Spirit guide my words was freeing. It’s not about using special words or poetic phrases. There are no right or wrong words to say. Just speak what’s on your heart and have a conversation with God in that moment. 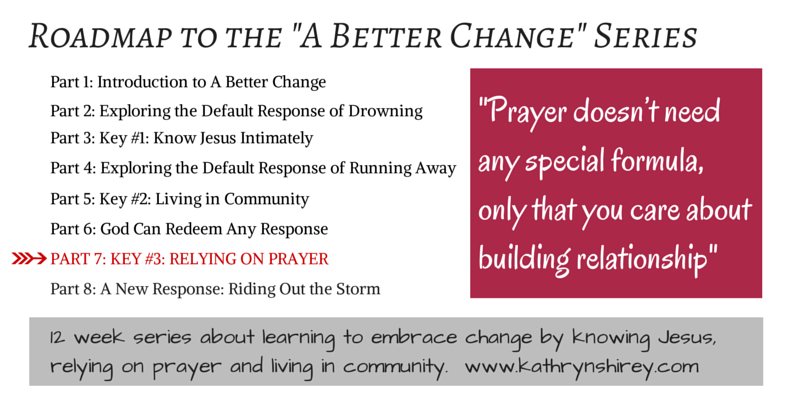 I found this great post by Cathy Peek this week that had some simple ideas to incorporate prayer throughout your day. Finally learn how to really pray and explore over 20 different methods for prayer with the FREE Pray Deep Prayer Cards. Deepen your prayer life and find renewed hope through God. Deepen Your Prayers! Want to take your prayer life deeper, build better prayer habits, and hear God more clearly? Have you visited the Store yet? Find resources to help you learn to pray, deepen your prayer life, explore spiritual disciplines, find hope and peace through a storm season of life, and step fully into God's plans for your life. Click here to ignite your spiritual life! We just had this discussion in Bible study on Sunday about how we can pray and how it can become a conversation. Love your suggestions! Thanks for linking up to Testimony Tuesday! Case and point, I loved your prayer in bible study on Monday! Wow, it was powerful!! Thanks, Lindsey! I’ve come a long way in feeling comfortable praying aloud 🙂 Had to laugh a bit at God’s timing that afternoon when I realized this post was publishing – probably no accident I was volunteered to pray Monday, huh? Kathryn, this was a wonderful post. We so view prayer as needing to be expressed “perfectly” and yet God knows how messy our hearts can become at times. 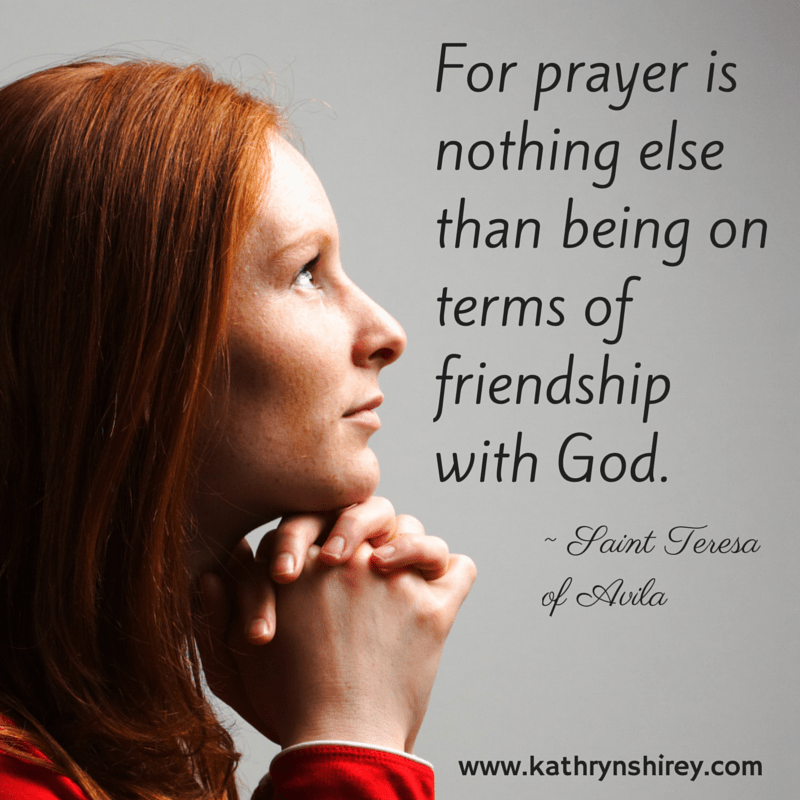 Prayer = conversation with God. A conversation with a friend flows our of relationship with that friend & a comfortableness which stems from the fact that our friend knows us. Such a practical & helpful way to approach prayer. I used to think God only wanted to hear prayers with eloquent words, but know I believe the most beautiful prayers to Him are ones spoken with our own words. That shift really opened prayer to me and made it more accessible. Blessings to you this morning! I’ve never heard it put “compliment” but I really like thinking of it that way! Having a conversation with God sounds so simple, but it doesn’t always seem so easy. The post had good suggestions but your prayer in italics was wonderful! I struggle to pray enough and this was a great reminder to pray about prayer! Thanks! I do find sometimes I need to pray about prayer and about helping me stay rooted in Him all throughout the day. Glad you like it! Kathryn, this was a great post! I always ask the kids I teach…”Who can talk?” with every hand up in the room, then I say, “Then you can pray…because prayer is just talking to God.” In the Christian world so many times we are guilty of making the simple things complex or trying to make an eloquent art out of something that is just simply sharing our heart. Pray you heart out sister! Be yourself…not that stuffy “church-a-neese”. Pray with sincerity, passion, a burden and most of all love. –Thanks for sharing my post sweet friend! I love that! If you can talk, you can pray! I am often surprised by how many people don’t know how to pray. For me, it’s a daily moment by moment conversation with our Savior. I’m so glad you have found a wonderful way to open up to Him and make prayer a regular part of your day. This is such a great list to help encourage others who are seeking to understand prayer better! Great job! Great suggestions, Kathryn! I tend to be the person that buries my head when asked to pray just as you. I have learned that a simple conversation is the best approach and as a result I have gotten better. What I know for sure is that praying is a such a blessing for all the others who are joining you in that prayer. One person should never have to be the Pray-er! Have a beautiful rest of the week!